Three European nations – those referred to as ‘the big three’ in the corridors of the EU – spoke for Europe at the recent 2012 Shangri-La Dialogue. The UK sent the Minister of State for the Armed Forces, and Director-General, Security Policy. Germany sent their Parliamentary State Secretary for Defence. 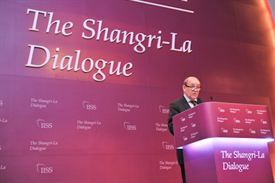 The most significant showing was France’s Minister of Defence, Jean-Yves Le Drian, who used a speech on Emerging Risks to Global and Asia-Pacific Security to communicate the intention of France, representing Europe more broadly, to step up its involvement in Asia-Pacific security. France’s rationale was placed in the context of the rising economic importance of the region, the US ‘pivot’, and the inter-dependence of European and Asian security. France’s historical involvement and ongoing ‘territorial and military presence’ were noted to remind the audience that France had never left the region. Then the high rhetorical tone was brought down to earth by an honest acknowledgement that all this had been said before, but now it was “… high time to transform words into action“.